Our lives were quite busy leading up to Christmas with friend activities in Nashville and then we headed to Cincinnati for Christmas with my side of the family. We were supposed to have Christmas with my sister and her two kids along with my aunt and grandmother but Asher came down with croup so my sister and her kids stayed away. Thankfully we didn't have to cancel all of Christmas. 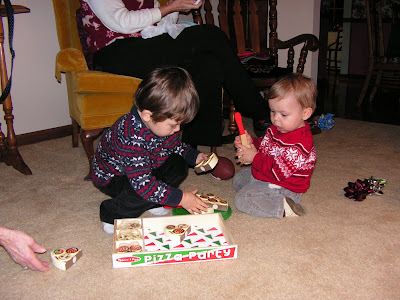 Asher and Jonas enjoying playing with Asher's wooden pizza set from my mom and papa Bruce. My mom helping Jonas unwrap a gift. 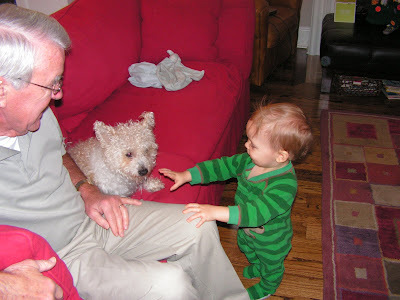 (He is only acting like he can't open it so he can have some lap time with his Nana.) My aunt Candy is videoing for all of us in the background. David's parents came to our house for Christmas Eve and then returned Christmas morning to see the boys open their gifts. The boys were so glad to have them there, especiallly since they brought their dog, Princess! 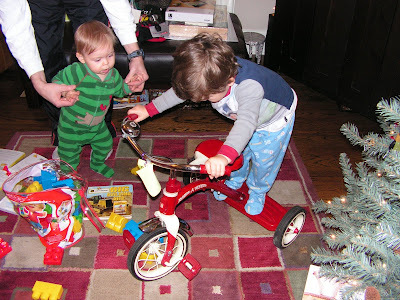 Asher trying out his "new" (consignment sale purchase) bike! Jonas looking on and trying not to covet. Ha! This picture pretty well sums up our Christmas with the Wilsons! 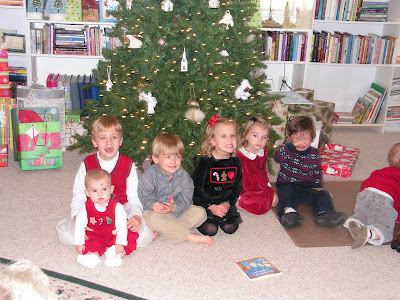 Our nephews and neices had a great time but our kids were sick (Asher with croup and a fever) and tired (Jonas missed his morning nap b/c we were taking Asher to the doctor before going to David's parents.)! Glad that the rest of the family put up with our kids in such positions. 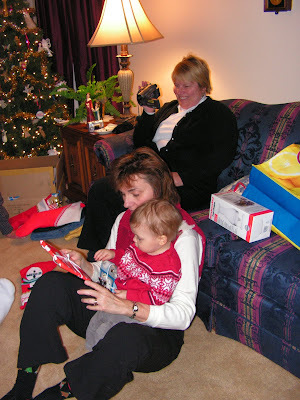 Well that is a quick summary of our 2009 Christmas! Jonas ended up having a fever on New Year's Eve that kept lingering and after two visists to the doctor's office we found out he had RSV (bronchiolitis) and a right ear infection. 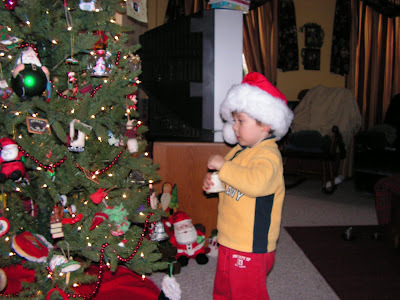 (He also had this a year ago during Christmas 2008!) So we are now glad the holidays are over, we are all on the getting better side, and we have the internet again (our internet has been down for awhile, in case you were wondering why it's been so long!). It's good to be back in the blogging world! !